Serve these brandy-sauced prunes over ice cream, pound cake, or both. 1 of 3 Remove rind from oranges, without bitter white pith. Cut into long, thin strips. 2 of 3 Halve oranges; squeeze juice from both oranges into medium-size saucepan. Add orange rind, prunes, water, honey and cinnamon; bring to boiling. Reduce heat; simmer 4 to 5 minutes or until prunes are soft and plump. Remove from heat. 3 of 3 Stir in brandy and vanilla. Let cool to room temperature. Pour into refrigerator container; cover; refrigerate for at least 24 hours before serving. Remove cinnamon stick and discard. 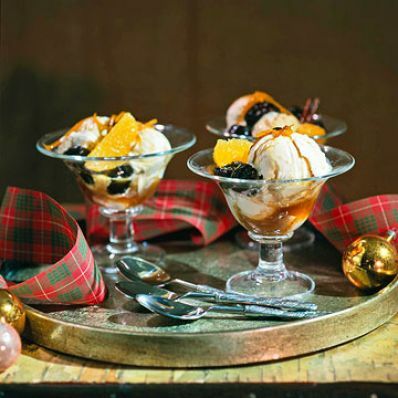 Serve orange-prune mixture over ice cream and garnish with orange sections if desired. Makes 8 servings. Per Serving: 2 g pro., 225 kcal cal., 3 mg sodium, 51 g carb., 0 g Fat, total, 0 g sat. fat, 6 g fiber, 0 mg chol.